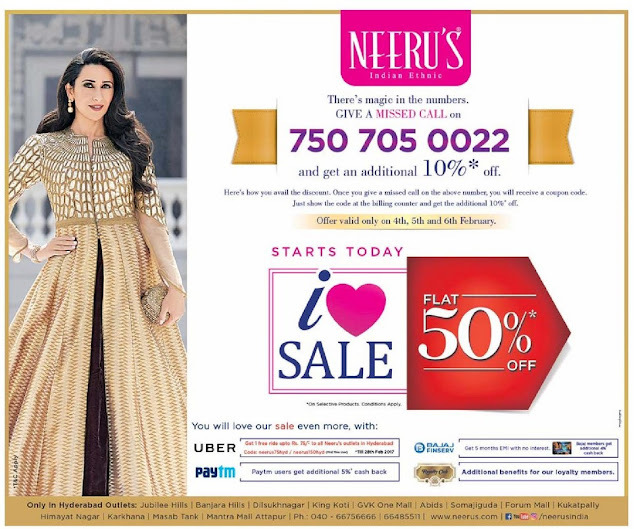 Neerus flat 50% off sale. Offer valid from 18 , 19 and 20 th March 2017. 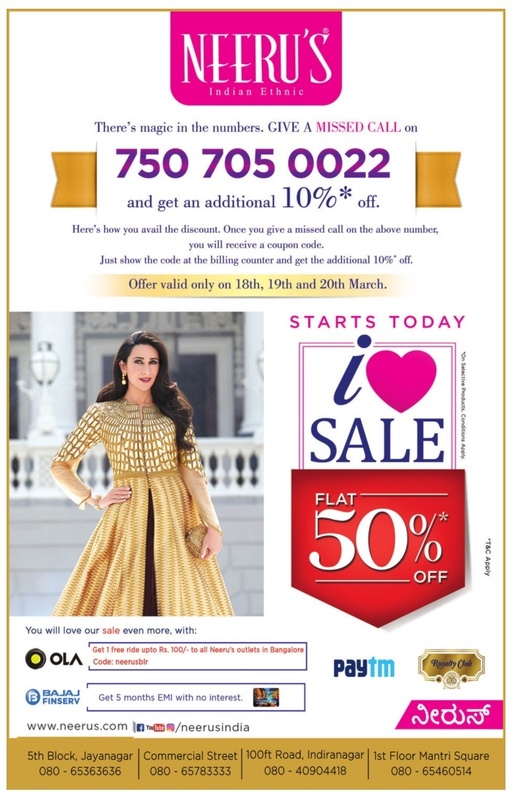 Give a missed call on 7507050022 and get additional 10% off. Here's how you avail the discount. Once you give a missed all on the above number, you will receive a coupon code. just show the code at the billing counter and get the additional 10% off. Get Uber free ride up to Rs 75 to all neerus outlets. Pay through Paytm and get additional 5% cash back. 2016 discount offers, Clothing discount offers, Fashion offers, Gold offers, Footwear offers, discount sale, festival sale, cashback offers, ashadam sale, sharavanam sale, KG sale, independence day offers, Dasara festival offers, Dasshera offers,Diwali/Dipawali festival offers, Sankranthi offers, Ugadi offers, Weekend offers, Big discount mela, Happiness sale, Flat 50% off discount, Flat 50% off discount, Big bang sale, Special sale, Lifestyle, Big Bazar, Central, brand factory, Jade Blue, Bombay dyeing, splash fashion, Jewellery, Diamonds, home town, Home, shoppers stop,Special price, merchandise, Accessories, Lowest price sale, Biggest brands, Biggest savings, Fashion accessories discount. Sarees, Kurthis, lahenga,bangles,offers, Coupons, Gift Vouchers offers, Free gift vouchers, Cashback offers, Karthika Kalyana vibhogam, Trendy designer sarees, youth full dresses, All branded men's wear, cute kids wear, pattu -fancy sarees, chudidar, ghagras, Kanchi, dharmavaram, uppada, aarani, pochampalli, gadwal, kerala sarees, 2017 offers, January, February, March, April, May, June, July, August, September, October, November, December offers, year end, christmas, Happy new year,Brands: Lifestyle, Hypercity, Shoppers stop, pantaloons, Max, MArks&Spencer, Home town, Funcity, The raymond shop, Puma, Ramesh watch Co. Only, Jack and Jones, U.S. Polo ASSN, Pepe Jeans london, AND, globaldesi, Crossword, Calvin Klein jeans, Nautica, Vero Moda, ethnicity, mothercare, barbie, Hidesign handcrafted since 1978, Pavers England, Mebaz, Aeropostale, United colors of benetton, Rocia shoes, United colors of benetton kids, Krishna pearl & jewellers, Bagit, Accessorize, Inc.5, Lee, Wrangler,Mufti, Republic day offers, valentine's day.